For years, if you asked Pontiac executives when the division was founded, they would tell you 1909, the year the Oakland Motor Car Company became a division of General Motors. 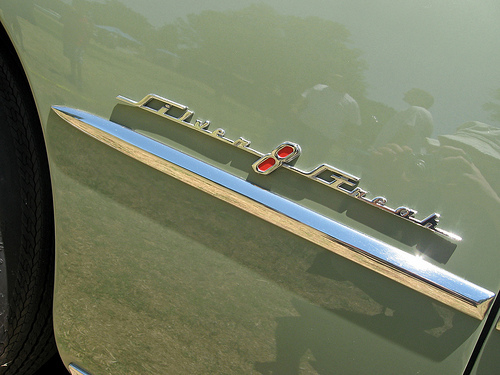 The Pontiac brand, however, was born in the economic boom of the mid-1920s, part of GM president Alfred P. Sloan’s plan to fill the gaps between the corporation’s various makes by giving each division a complementary “companion make.” Cadillac was paired with LaSalle, Buick with Marquette, Oldsmobile with Viking, and Oakland with Pontiac, which took its name from Pontiac, Michigan (where Oakland was headquartered) and Chief Pontiac, the 18th-century Ottawa leader whose stylized likeness became the new car’s mascot. The original Pontiac was one of GM’s first exercises in what we would now call platform sharing. It was based on the contemporary Chevrolet, sharing much of its running gear, but it was somewhat bigger and offered a distinct appearance and a new 187 cu. in. (3,059 cc) six-cylinder engine. Since the Chevrolet had only a four, the Pontiac had little difficulty justifying its $180 price premium and quickly became very successful. By the time of the Crash, Pontiac was GM’s second best-selling marque. By 1931, with the U.S. economy in ruins, Oakland and Pontiac were moribund and GM seriously considered terminating them both. Sloan still saw a need for a mid-priced brand between Chevrolet and Oldsmobile, however, and since Pontiac was now outselling Oakland by more than five to one, it seemed to have the better future. In 1932, GM abandoned the Oakland brand and the division was officially renamed the Pontiac Motor Division. 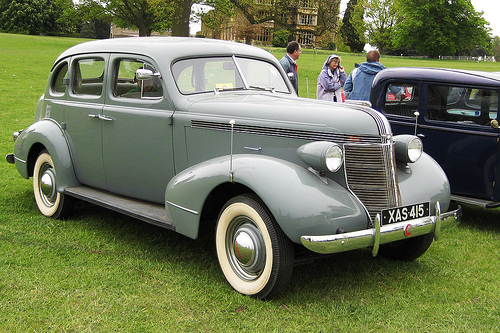 Although the Depression was a difficult time for every automaker, Pontiac sales recovered by mid-decade thanks to increased commonality with Chevrolet, a newly optional straight eight, and attractive new styling. It was not a flashy or exciting car, but it represented good value for money and was consistently in fifth place in overall automotive sales, occasionally reaching as high as fourth. That conservatism served Pontiac well in the thirties and was no particular handicap in the postwar sales boom. Pontiacs were nicely styled, reasonably priced, and reliable, and they offered a lengthy list of factory and dealer accessories to fatten the profit margins. It was not until the Korean War that Pontiac began to stumble. Wartime restrictions on production and consumer credit caused 1951 sales to fall nearly 20% and another 26% for 1952. When the restrictions were lifted, Pontiac sales recovered, but its market share remained static while GM’s other brands grew at impressive rates. By 1954, Pontiac was more than 150,000 units behind Buick and about 65,000 units behind Oldsmobile despite those rivals’ higher prices. Pontiac still enjoyed volume of which the independents could only dream, but something was clearly wrong. The 1949 models were Pontiac’s first postwar restyling, although they still offered fastback styling, originally introduced in 1941. Fastbacks were called Streamliners; notchbacks were Chieftains. Both were available with either the six or the straight eight. The postwar “Silver Streak 8” was little changed from its prewar form, still displacing 249 cu. in. (4,078 cc). It now made 104 hp (78 kW) with manual transmission, 108 hp (81 kW) with Hydra-Matic. 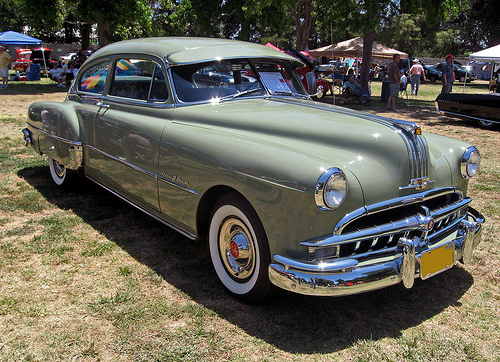 It’s tempting to blame Critchfield for Pontiac’s slump, but by the time he arrived in 1952, the styling for the 1955 models was well under way and many major engineering decisions had already been made. Perhaps the most critical of those was the decision to delay the launch of Pontiac’s new OHV V8 engine. The division’s engineering staff had been working on the new engine since 1946 and it would have been ready for the 1953 model year, but chief engineer George Delaney had asked for an extra two years to resolve some design and manufacturing issues. Delaney’s concerns about reliability and production costs were commendable, but the lack of a V8 certainly hurt Pontiac in 1953 and 1954. The mid-priced market was becoming tougher and Pontiac was being squeezed both from below — by models like Chevrolet’s plush Bel Air — and from above; Buick’s entry-level Special was priced to compete with the Pontiac Eight. 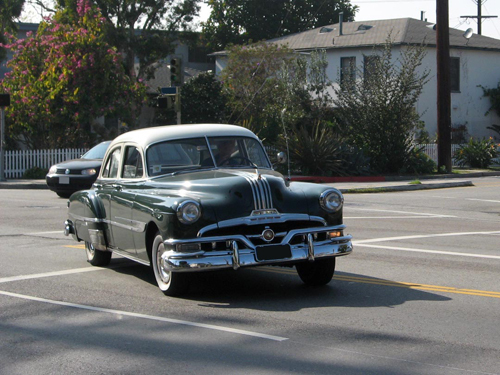 A 1952 Pontiac, still sporting the division’s trademark Silver Streaks. We’re unable to definitively confirm this model’s identity, but the odds are that it’s a Chieftain Eight DeLuxe, the most popular 1952 Pontiac by a significant margin. For 1952, the old flathead straight eight was up to 268 cu. in. (4,398 cc), making either 118 or 122 hp (88 or 91 kW); the latter was standard with Hydra-Matic, which most buyers preferred. Pontiac’s new V8 finally debuted for the 1955 model year. It was a fairly orthodox design with cast iron block and heads and pushrod-operated overhead valves. 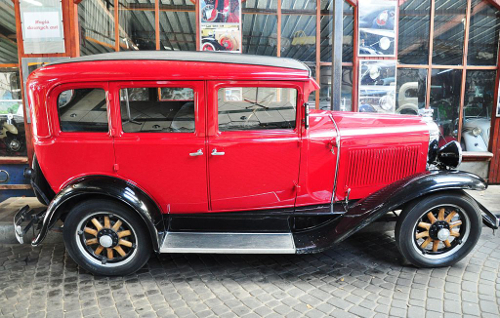 (It was not the division’s first V8 engine; back in 1932, Pontiac had briefly offered a 251 cu. in. (4,106 cc) V8 with a flat-plane crank, inherited from Oakland.) It had two novel features: reverse-flow cooling (pumping coolant through the heads and then the block rather than the other way around) and a then-novel “Ball-Pivot” valvegear layout. Great, informative article, as usual…but, the last page needs reformating as text is cut off on the right. Okay, I figured out the problem. It appears to be fixed in both Firefox and IE, although you might have to clear your temporary internet files to get it to reload properly. As the longtime owner (1974-91) of a ’66 Bonneville convertible, I think you should have mentioned that the 1965 redesign increased the proportions of the larger full-size cars (i.e., the Star Chief and Bonneville series except for the Safari wagons) to about those of 1959-60: Mine had a 124-inch wheelbase and a total length of 222 inches. Thanks for all the detail about the pre-Wide Track period, as well as the reference list. That’s a reasonable note. I had wanted to mention the larger dimensions, but there wasn’t an easy way to include it in the text; I added it to the caption. I have no explanation of the offset grille lettering on the red Bonneville. Maybe it was missing when the owner got the car, and he or she wasn’t sure exactly where it was supposed to go — I don’t know. To say that there was no reason for Pontiac’s existence is a very shallow statement. The Pontiac Motor division of General Motors designed and built some of the most Iconic car of the 20th Century. There contribution to both Stock Car Racing and drag racing was no small accomplishment. The beautiful full size cars of the late 50s and all through the 60s were some of the most beautiful cars ever sold by GM. 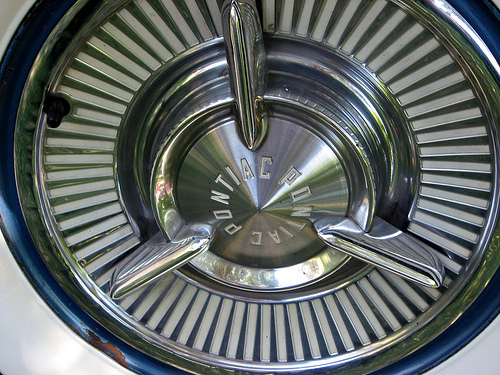 The Pontiac was a step up for blue collar workers who couldn’t afford a Buick or Cadillac. And all this is not to mention such popular Icons as the GTO or Fire Bird (Trans Am). Give me a Break! First off, another interesing article. However I am still having the problem with the text formatting on the last page. I read your articles on my iPhone so I thought it was just the iPhone. It formats correctly on my iPad. I have had the same problem with some other recent articles, always on the last page. But I keep coming back anyway. Oh, and in the photo caption where you detail the expansion on Pontiac’s V8 there is some apparently unintended repetititon. Thanks for the tip on the photo caption — fixed. My apologizes for the formatting problem. What appears to be happening is that certain browsers are objecting to the text links; some browsers refuse to wrap text that looks like a link, which is breaking the margin. I managed to fix it in IE, and I tinkered with it a little more just now, but the smaller window of mobile phone browsers may still present problems. I just found out about this last night, so I haven’t had a chance to address it in previous articles. Nice article. One question – I had always heard that the X-frame was pretty stiff. Given that GM sold large numbers of four-door hardtops, I would think that a willowy frame would have allowed those bodies to quickly twist themselves apart. The big problem with the X-frame was lack of side-impact protection. I’ve seen Ford ads from 1961 comparing the full-size Ford frame with the X-frame (without ever mentioning Chevrolet or GM) to make an obvious point regarding safety. What is interesting about Pontiac is that, after about 1963 or so, it achieved success in spite of, not because of, GM’s top management. GM’s executive team fought Pontiac management on several key issues, even as the division was setting sales records and had a great reputation. In some respects, Pontiac was the BMW of the 1960s, in terms of image and the demographics of customers who bought the cars. The X-frame itself was relatively stiff — not quite as stiff as a full ladder frame with X-member, but stiffer than the later perimeter frames. The big problem was that it didn’t do a very good job of preventing the body itself from twisting, which a big hardtop generally does very readily. Pontiac’s [i]pitch[/i] in the sixties was very similar to the one BMW adopted later, and when Pontiac returned to that message in the eighties and nineties, they positioned themselves pretty deliberately as the poor man’s BMW. Pontiac’s [i]demographics[/i] were not that much like BMW’s; they skewed a good deal younger. Both were selling sportiness, but a lot of customers bought BMWs because they were expensive and prestigious, much more so than with Pontiac. The late fifties really marked the beginning of GM’s efforts to exert tighter corporate control on the divisions. The senior compacts were really the first salvo, and I think the corporation was frustrated that those cars ended up having so little in common. Senior management kept pushing for more commonality, and more control over divisional operations. One of my sources said that in 1960, a general manager might have to meet with senior management once a month to check in; in 1969, they had to attend corporate meetings at least once or twice a week. Even in the early fifties, GM senior management lived in mortal fear of the feds. Their primary fear was the anti-trust division of the Justice Department — they were terrified of being split up, or being forced to spin off Chevrolet — but they also feared federal regulation. There were already growing safety and emissions lobbies in the early sixties, even before Ralph Nader, and GM was afraid of doing anything that might appear provocative or irresponsible. Pontiac’s success put them in an awkward position. They were pleased about the increased sales, but some senior executives felt that Pontiac was putting the whole corporation at risk with childish stunts. They kept wishing there was a way to maintain the sales while taking a quieter, more dignified, less provocative approach. Were the wide track cars actually made up of wider axles and front suspensions. I remember pontiac wheels had a deeper dish than chevy wheels, but would bolt right on an impala to make it a wide track, too. I’ve never compared the axle tube length of a ’59 Pontiac to a ’59 Chevrolet, but I believe the reason for the deeper-dish wheels was to accommodate the bigger brake drums; Pontiac expanded the width of its drums by an inch in 1959. The wheels probably accounted for a portion of the track increase, but I don’t think all of it. Keep in mind that both front and rear track width increased about 5 inches from 1958. The whole axle assy. is different than the Chevy. The housing is larger and the third member is bigger with it’s ring gear at 9.3 inches it shares with Oldsmobile. The axle assy. is a three link attachment When the 61-62 model Pontiac came out and being downsized in length as well as width the axels were shortened, but the third member remained the same. 1961-62 along with 63-64 are four link attachments. 59-60 cars have a rear track of 64 inches. The downsized 61-62 Pontiac’s rear track is 62.5 inches. 1963-63 Pontiac’s return to 64 inches. Going back, the 57 is the beginning of this large 9.3″ third member, but the 57 has a 27 spline axle and a narrow 58″ track. The 58 cars get a 58″ track but the axels are now 32 splines and for the first time Safety Track was offered. So, the 58-1964 third members are interchangeable. As far as track increases we have 1958 at 58 inches front and rear. 1959 has front at 63 7/8″ rear at 64″. 1960 front at 64″ rear 64″. 1961-62 at front and rear both at 62.5 ” and 63-64 cars at 64″ front and rear track. A full ten inches shorter in 1961. That’s amazing. I’ve always wished I could have been alive in 1960-61 when American car design rationalized so quickly and completely. Probably nothing demonstrated the shift more completely than the Lincoln Continental. Imagine how the new cars looked on roadways still full of fins, chrome, and two- (and three-) toned leviathans. Well, aside from Harley Earl, who was on his way out or gone when the 1961 cars were designed, I think a lot of American stylists regarded the fins, chrome frosting, and jukebox excess with varying levels of disgust and had gone that way mainly because the sales and marketing people had insisted that’s what the public wanted. The recession and generally dismal sales of 1958 gave the naysayers the leverage to steer things in a different direction. (“If that was what people wanted before, it sure isn’t now.”) Had the ’58 cars sold really well, the shift probably would have taken a little longer, but it probably helped that the stylists were very willing, even eager, to tidy things up aesthetically. Understood; however my impression is that at the time fashion ruled supreme and a change was in the offing no matter what the status quo was. Just as with clothing fashion–whatever’s in style now will be out of style tomorrow. Fascinating topic though! Fords were totally changed every year from 1956 through 1961 IIRC. Chevies just one year behind (their 59 and 60 were similar).. While designers do have to be cognizant of fashion trends, it’s also important to remember that the logistics of automotive production mean that stylists are always working about three years ahead, so they also need to anticipate and to some extent dictate public tastes. (The gap is sometimes shorter than three years — as discussed elsewhere, the ’59 GM cars were redone very hastily in mid-1956 in reaction to the not-yet-released ’57 Chryslers — but three years was the norm and anything shorter than that was both difficult and expensive.) Occasionally, the stylists are caught off guard, which is what happened with the Pontiac split grille: The 1960 grille was designed, signed off on, and handed off to production engineering before the ’59s went on sale. This is why the sales force was often able to push for more chrome, bigger fins, etc. — since the automaker was trying to look three years ahead, a lot came down to the sale organization’s professional judgment about what they thought would sell. The general pattern for mass-market American cars of this period was to retain the same basic body shell for two or three at a time with a visible but structurally superficial restyling every year. Again, there were exceptions to that; for example, Chrysler’s big Imperial retained the same shell for longer while GM’s ’58 cars were a one-year body. The latter was very expensive and was again dictated by the last-minute redesigns of the ’59 cars (which were originally supposed to be facelifts of the ’58 shell). Non-U.S. and later cars tended to have longer life cycles in part because development costs in general have gone up and in part because unitized construction costs more to tool and thus requires a longer amortization period. It’s important to keep in mind that by the fifties, Earl was not a designer in any active sense and hadn’t been for many years. He was a corporate vice president responsible for a bunch of different individual studios and a staff that I think was bigger than all the design staffs of all the other contemporary American automakers put together. His role in the design process at that point was that of a high-level manager who comes in periodically to demand a little more of this and a little less of that or warn that he didn’t want to see a particular rendering ever again. He was like a movie producer as opposed to a director, an actor, or a composer: You would rarely seen any specific element that he personally contributed and the average viewer wouldn’t necessarily know what he did, but he nonetheless bore overall responsibility for what got made and what didn’t. Style is by definition an ephemeral and transitory phenomenon. Every designer whose career isn’t cut unnaturally short for some reason has their share of hits and misses, some of which really only make sense in the context of their time. Harley Earl’s lasting contribution, and what makes him stand out from his peers, is that he carved out a place for styling and the creative process in a corporate industry dominated by engineers (before the war), accountants, and (later) MBAs, most of whom are thoroughly convinced that any business operation can ultimately be reduced to a series of mathematical operations. Earl managed to outmaneuver, intimidate, and dazzle those people with a combination of politicking, showmanship, and consistent sales success. He made them recognize that what his staff did had value and that for best results, the bookkeepers, the engineers, and the efficiency experts needed to keep their hands off the process. That’s a pretty remarkable achievement considering that he was originally hired on a short-term consulting contract! Earl established the automotive styling *organization* and for better or worse the products of that organization set the standard for about 50 years. While you can point to various specific examples where a rival beat GM to the punch with a specific feature or did better with a particular theme, they were responding to or hoping to put one over on GM designs. That was due in no small part to the fact that a great many of the American stylists of that period who went on to work elsewhere (including Virgil Exner or Frank Hershey) were veterans of the GM styling organization and carried that model with them. So, while one could argue that the designs of, say, Bob Gregorie working with Edsel Ford were more tasteful or better realized, Harley Earl remains THE figure of American design. You might love him, you might hate him (and I think people who worked for him felt both, depending on the day), you might think him overrated, but he’s really difficult to ignore. That you can come up with such reasoned, comprehensive, captivating–and above all well-written–replies virtually in real time sort of blows my mind. Just discovered your site last night but I can see I’ll be spending a lot of time here! You state that the 1957 Bonneville was only available as a convertible. It is my recollection that fuel injection was available in 1957 on the Bonneville convertible (my friend had one, silver with silver leather interior) and on (of all things) their station wagon, which was probably a Safari but a Bonneville by a different name. So although the Bonneville model was only available as a convertible, in essence you could get the equivalent in a station wagon, but it carried the Safari name (the mid-50’s Safaris were 2-door and every bit as stylish as the Chevrolet Nomads as they were essentially the same car). And the 1959 Safari in Sunset Glow with matching tri-color interior was absolutely stunning, for a station wagon! In 1955 the Safari was a short wheelbase wagon with StarChief trim appointments, and leather seated interior just like the StarChief. This carried over for 1956 and 57, although late in the 1957 season a new wagon was added with all the appointments of the two door safari, it was called the Trans Continental. The 57 Bonneville was only a convertible and all were fuel injected. No other 1957 Pontiac model Pontiac could be ordered with fuel injection. An excellent and well written read. It would be great to have included a little more content of the 70’s but still very interesting. As the second owner, my father was the original owner of a S/O 59 Catalina sport coupe, my dad ordered a 345 hp tri-power engine with a heavy duty Supra HydraMatic 4 speed with three gear sets. Most people who have 1959 or 60 Pontiac’s that were ordered with Tri-Power received the 315HP for 59 or the 318hp for 1960. The difference is in the bottom end of the engine ( 4 bolt mains oil pump etc. and the cam plus the cylinder heads. Our car was ordered from the zone office, and most dealers didn’t know about a 330 hp four barrel (NASCAR) engine or the 345HP Tri-Power engine used for NHRA drag racing. When we picked up the car at a dealer my dad chose and did the walk around. We found in the trunk the two third members for drag racing we had ordered, but also a solid lifter cam and lifters to make the engine a 345HP car. You see in those days unlike Chevrolet, Pontiac could not sell a car with a solid lifter cam and warranty the car. The cam that was in the engine was the original Hydro cam #886 that was first used in the 285hp dual quad 1956 317″ engine. FYI this Catalina, while ordered out of the L.A. zone office was not built in the South Gate Plant. The car was built in Mi. and railed to the west coast because the engine was hand built and balanced in the Pontiac tool room like all NASCAR engines were. FYI, the 1959 389″ 2bbl@ 280hp, the 389″ 4BBL @ 300hp and the 389″ Tri-power @ 315HP all used the very good #472 Hydraulic cam. In the 1960 engine the same cam was used but the HP increased on all three engines by 3HP and this was due to a bump in compression by .25. All these hydraulic cam engines above are for the HydraMatic cars.